Here's an easy neck warmer pattern that's perfect for anyone who wants a simple quick knitting project. And it's so easy and simple to knit you'll want to make more than one. 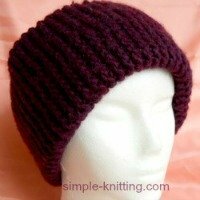 Come on all new knitters, it's a great pattern for you too. I whipped up a couple of these one night when it was bitterly cold outside. I use one as a neckwarmer and one as a knitted headband to keep my ears and head warm and it's great! I didn't really want to make a full length scarf or anything like that. I just wanted to keep warm without all the extras if you know what I mean. 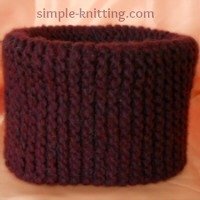 I just love the simplicity and versatility of this simple and easy knitting pattern. I hope you do too. Any by the way, this is also a great mens knitting pattern too. It's great for everyone. For this neck warmer pattern I chose a nice thick acrylic/wool yarn and knit it extra wide so that it could be folded in half and doubled up for extra warmth. To name a few and they're all lovely yarns that will work well for this knitting project. Just as a side note here this neck warmer pattern will make an easy quick knit gift for someone as well. And it's also a great charity knitting project. Just pick out some of your favorite dreamy color yarns and get started knitting. And have some fun knitting them up. Measurements: Circumference is approximately 18 inches without being stretched and the depth is approximately 10 inches. Materials: Any 5-Bulky yarn will work. I used 1 skein of Bernat Roving in the color plum or whatever color you like. You may find it easier to seam up the neck warmer with a different yarn. Roving yarn doesn't seam up very well and tends to come apart as you're seaming. That's because it's not a twisted yarn so it tends to break easily. When the yarn is knitted it's strong but when you keep pulling it through to seam with it the friction causes it to break. Try a worsted weight yarn that closely matches the yarn you used. Of course if you want to try using the roving yarn do give it a try. I did use it for the neck warmer pattern and it did come apart at times. Work garter stitch for approximately 106 rows (53 ridges of garter stitch). Finish: Sew up seam and enjoy. (See pattern notes about seaming).